Few things have affected the culinary world like globalization. Within the last two decades, inquisitive culinarians have been catapulted into the future, and walking through any big city exposes us to countless opportunities to enjoy authentic culinary delicacies from all over the world. Many foreign foods are now mainstream items in most supermarkets, and almost every well-stocked grocery store will have several aisles full of imported delicacies well beyond jasmine rice and soy sauce. One example of this trend is the exploding popularity of sushi, which was once familiar only to a select few, as its high price in high-end Japanese restaurants discouraged many would-be connoisseurs. Recently, however, sushi has made its way into moderately priced mainstream restaurants as well as take-out establishments and the refrigerated section of many grocery stores. Sushi has its roots in the need to preserve fish. Salted fish and/or seafood is inter-layered with rice in wooden molds, pressed, and left to ferment for several months. Commonly, rice vinegar is added to control the fermentation and add a pleasant flavor and acidity. Difficult to find nowadays, preserved sushi is known as nare sushi. 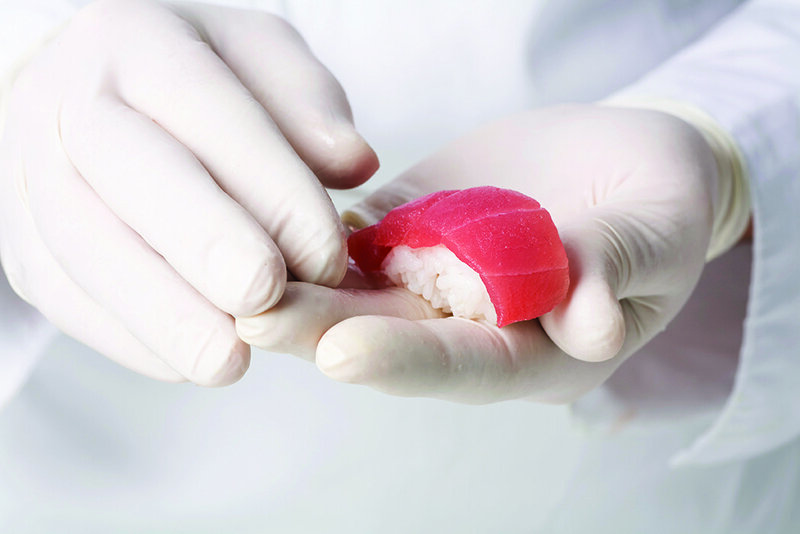 Unfermented descendants like battera or oshi sushi, which means “pressed” sushi, are still popular. 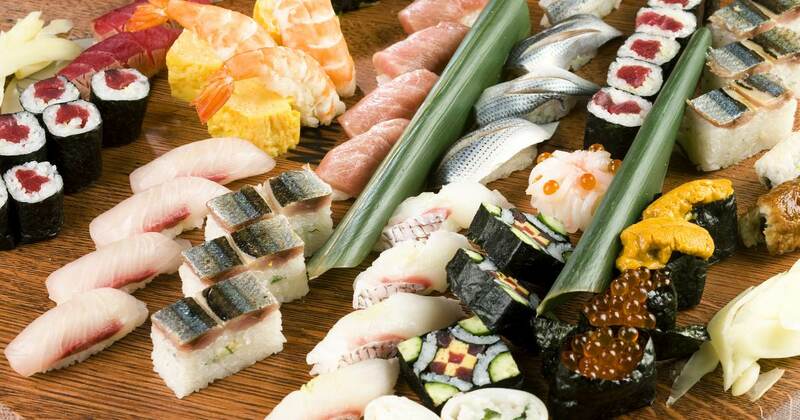 Contrary to popular belief, sushi does not always contain raw fish. Literally translated, the word means “seasoned rice,” and that is exactly what sushi is: perfectly cooked, slightly vinegared, sugared, and salted rice combined with various toppings or stuffings such as seafood, vegetables, or, sometimes, meat. Oftentimes, konbu is briefly simmered with the rice. This giant kelp, a common ingredient in Japanese cuisine, is rich in glutamic acid, a natural flavor enhancer. Condiments served with sushi include Japanese soy sauce, wasabi, and pickled ginger. Proper preparation of the rice, the main ingredient in sushi, is essential. Japanese short grain rice is the only kind suitable for sushi, and only the highest grades should be used. Its relatively low starch content results in just the right cohesiveness and mouthfeel. It is important to wash the rice thoroughly in several changes of water to remove all surface starch; neglecting this step results in gooey and sticky rice balls. When the water runs clear, let the rice sit in water for 20 minutes before you drain it. Make sure to use clean-tasting water to cook the rice. Strongly chlorinated water or other flavors will affect the final product. Filter the water if necessary. Since the rice has absorbed some water during the washing and rinsing process, equal amounts of rice and water by volume are sufficient to cook the rice. More water would cause the rice to overcook. Combine the rice and water with a small sheet of konbu in a pot with a tight-fitting lid; bring to a boil over a high flame, stirring only once or twice to prevent sticking. Once the water simmers, remove the konbu, close the lid, and steam the rice over the smallest possible flame for approximately 10 minutes. Then remove it from the heat and let it rest for another 20 minutes. Do not remove the lid or stir the rice; it is very fragile at this stage and the grains would break and become pasty. While the rice rests, combine Japanese rice vinegar, sugar, and salt for the seasoning mixture. The rice vinegar contributes a pleasant acidity and the sugar counteracts its tartness. The salt ensures an overall well-rounded flavor. After the resting period, sprinkle the vinegar mixture over the rice and mix carefully with a wooden spoon; a hard metal tool would break the fragile grains and result in a metallic flavor. Place the rice into a bowl and fan cold air over the rice to cool it down slightly. This step will cause the rice to become shiny. Once the rice is no longer too hot to touch, cover it with a clean damp towel to prevent drying out. Having all toppings or fillings cut ahead of time will allow you to start preparing the sushi before the rice overcools. Cold rice is stiff, making it difficult to handle. Additionally, cold rice tastes pasty and dulls the flavors of the filling or stuffing. Hence, sushi should be enjoyed immediately after it is done. A makisu, a 10 x 10-inch mat woven from bamboo and cotton string, is an essential tool for making maki sushi, or cylindrical sushi rolls. For sanitary reasons, wrap the mat in plastic. Maki sushi is generally wrapped in nori, a dried sheet of pressed laver algae. However, other coatings such as a thin omelet or toasted sesame seeds are common. Another important ingredient when preparing sushi is tezu, the “hand vinegar,” a mix of equal parts rice vinegar and water. Applying it sparingly to your hands will allow you to handle the rice without it sticking. inch bare. If desired, smear some wasabi onto the rice and place the filling lengthwise onto the middle of the rice. The filling can be anything you choose and should be of impeccable quality and freshness; most common is raw, smoked, or cured fish, cucumbers, or other vegetables with a similar texture. For a regular-sized sushi roll, the filling should not be thicker than ¼ to ½ inch for easier rolling. With the filling in place, hold the mat with both hands and carefully roll the bottom end over the filling, taking care to press evenly across the entire roll. Continue to roll until the roll seals itself with the bare nori. 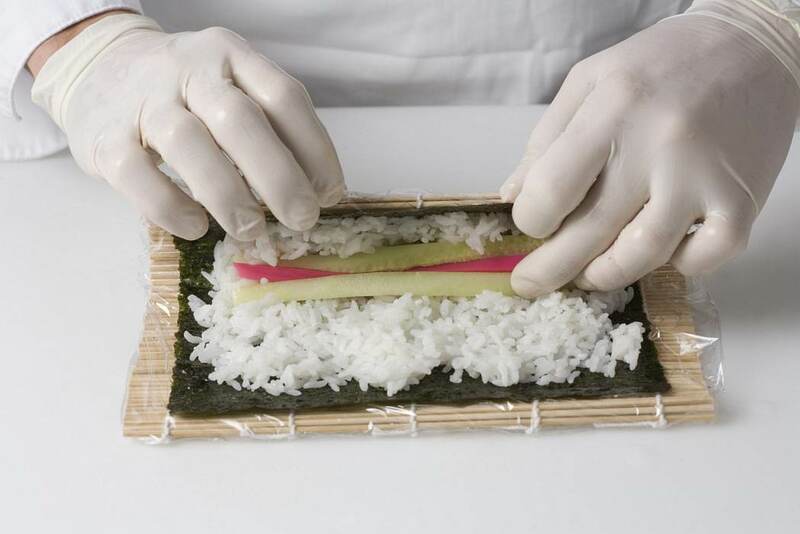 Wipe a very sharp knife with a damp cloth and cut the roll in half, and then cut the two pieces into thirds or quarters, resulting in six or eight pieces of sushi respectively, the common size of maki sushi. Another popular shape is nigiri sushi, literally meaning “hand-pressed” sushi. This version takes some practice to master. Nigiri sushi is small ovals of pressed rice with a firmly placed topping such as thin slices of fish or omelet. To prepare, start with moist hands and press the rice to a rounded oval not more than ¾-inch thick. Once the rice is shaped, spread some wasabi on it and place a thin slice of raw fish on the wasabi side. Then place the roll, with the fish side down, into the palm of your hand and press down with the stretched index and middle finger of the other hand until the fish is firmly attached to the rice. Sometimes a thin strip of nori is wrapped around the nigiri, resembling a belt. inches long by ¼ inch thick, and served with soy sauce, wasabi, and pickled ginger. For obvious reasons, the fish for sashimi needs to be impeccably fresh. Additionally, only prime pieces of the fish are good enough; for example, the thickest part of the center piece of the salmon. (The thinner pieces of the fish can be used for maki sushi as well as battera sushi.) For nigiri, chirashi, and sashimi, however, it is imperative to use the best pieces. There are two ways to slice sashimi: the flat cut and the angled cut. When you cut the fish, remove all sinews, fatty parts, skin, and bloodlines; they would negatively affect flavor and texture. Use a very sharp knife with a long blade, preferably a sashimi knife; these are only sharpened on one side of a blade, resulting in a very smooth cut. The knife should be sharp enough to slice through the fish in one stroke; a back-and-forth motion with the knife would rip the fish. Make sure the fish is dry and cold; well-chilled fish is firmer and therefore easier to slice. Arrange the fish nicely on sushi rice for chirashi, roll it into a sushi roll, or use it for nigiri sushi. Additionally, it is as good enjoyed by itself as sashimi. My friend and colleague Chef David Kamen once said, “One has not lived until he has had sushi at 5 a.m. at a small sushi bar at the Tsukiji Fish Market in Tokyo.” Having had the pleasure myself, I heartily agree. Well-prepared sushi with the rice still slightly warm and the tuna or salmon melting in your mouth is a culinary delight at any time. Enjoy it with a cup of sake or, if it is early in the morning, with a cup of unsweetened green tea. Whatever the occasion, sushi is always a good choice. Hinnerk von Bargen is a faculty member at the CIA San Antonio. He holds a Master Chef certificate from the Hotel School in Hamburg, Germany, and is a certified hospitality educator. Chef von Bargen has lived, worked, and traveled extensively throughout Asia.